This textbook acts as companion text for GIS Tutorial 2: Spatial Analysis Workbook (for ArcGIS 10.3.x) where you can match up the chapters in each book. Although not a necessity, I would recommend using both texts in tandem to apply the theory and methods discussed with practical tutorials and walkthroughs using ArcGIS. This is the second book of the series and follows on from The ESRI Guide to GIS Analysis Volume 1: Geographic Patterns & Relationships. The first chapter is, inevitably, an introduction to spatial measurements and statistics. You perform analysis to answer questions and to answer these questions you not only need data but you also need to understand the data. Are you using nominal, ordinal, interval or ratio values, or a combination of these? The type of value(s) will shape the analysis techniques and methods used to calculate the statistics. You will need to interpret the statistics, test their significance and question the results. These elements are briefly visited with the premise of getting more in-depth as the book progresses. The chapter ends with a section on ‘Understanding data distributions’ which is essentially a brief introduction to data exploratory techniques such as describing frequency distributions, spatial distributions, and the presence of outliers and how they can affect analysis. Chapter 2 discusses measuring geographic distributions with the bulk of the chapter focused on finding the center (mean, meridian, central feature), and measuring compactness (standard distance), orientation and direction of distributions (spatial trends). These are discussed for points, lines, and areal features and also using weighted factors based on attributes. 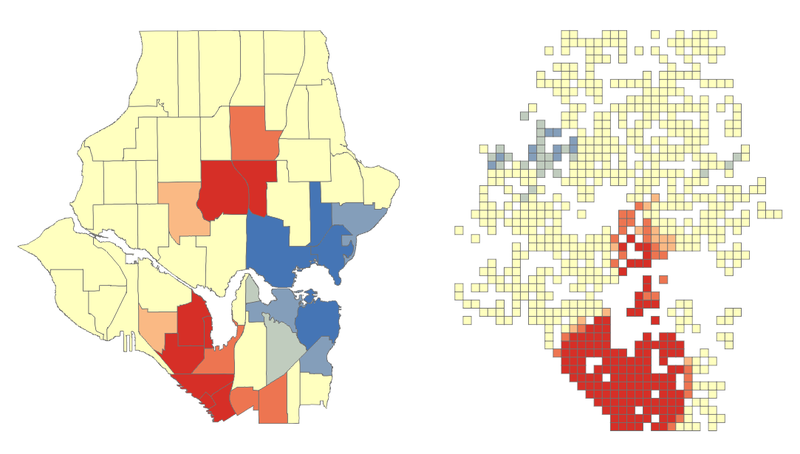 These are useful for adding statistical confidence to patterns derived from a map. Formulas and equations begin to surface and although not necessary to learn them off by heart, because the GIS does all the heavy lifting for you, it gives insight into what goes on under the hood, and knowing the underlying theory and formulas can often aid in troubleshooting and producing accurate analysis. The last section of this chapter is fundamental to the rest of the text, testing statistical significance. This allows you to measure a confidence level for your analysis using the null hypothesis, p-value, and z-score. This can be a difficult topic to comprehend and may require further reading. The third chapter, a lengthy one, is based around using statistical analysis to identify patterns, to enhance and backup the visual analysis of the map with confidence or to find patterns not may not have been immediately obvious. The human eye will often see patterns that do not really exist, so alternatively, statistical analysis might indicate what you thought was a strong pattern was actually quite weak. The statistical analysis methods are beginning to heat up and here we are introduced to; the Kolmorogov-Smirnov test and Chi Square test for quadrat analysis in identifying patterns in areas of equal size; the nearest neighbour index for calculating the average distance between features and identifying clustering or dispersion; and the K-function as an alternative to the nearest neighbour index, each used to measure the pattern of feature locations. These are followed by measuring the spatial pattern of feature values using; the join count statistic for areas with categories; Geary’s c and Moran’s I for measuring the similarity of nearby features, and the General-G statistic for measuring the concentration of high and low values for features having continuous values. The formulas for each are presented along with testing the significance of and interpreting the results. The final section of this chapter discusses defining spatial neighbourhoods and weights when analysing patterns. There are a few things to consider such as local or regional influences, thresholds of influence, interaction between adjacent features, and the rate of regional decline of influence. Chapter 4 is titled ‘Identifying Clusters’ with a main focus on hotspot analysis. First, we are introduced to nearest neighbour hierarchical clustering which is heavily used in crime analysis. While Chapter 3 discussed global methods for identifying patterns and returns a single statistic, this chapter focuses on local statistics to show where these patterns exist within the global setting. Geary’s c and Moran’s I both have local versions and their definition, implementation, and factors influencing the results are discussed and critiqued along with Art Getis’ and Keith Ord’s Gi* method for identifying hot and cold spots.While the methods in Chapter 3 enforced that there are patterns in the data (or not), the methods in Chapter 4 highlight where these clustered patterns are. The last section of Chapter 4 discusses using statistics with geographic data; how the very nature of geographic data affects your analysis, how geographic data is represented in a GIS affects your data analysis, the influence of the study area boundary, and GIS data and errors. The last chapter ventures away from identifying patterns and clusters and focuses on analysing geographic relationships and using statistics to analyse such. Geographic relationships and processes are used to predict where something is likely to occur and examining why things occur where they do. Chapter 5 looks at statistical methods for identifying geographical relationships with a Pearson’s correlation coefficient and Spearman’s correlation coefficient discussed and assessed. Linear regression (ordinary least squares), and geographically weighted regression are presented as methods for analysing geographic processes. These methods warrant a full text in their own right and there is a list of further reading available at the end of the chapter. Overall Verdict: I feel that I will be referring back to this text a lot. Having recently completed a MSc in Geocomputation I wish that this had crossed my path during the course of my studies and I would highly recommend this book to anyone venturing into spatial analysis where statistics can aid and back up the analysis. Although they are littered throughout the chapters, you really do not need to get bogged down with the formulas behind the statistical analysis techniques, the most important points is that you understand what the methods are performing, their limitations, and how to assess the results and this book really is a fantastic reference for doing just that. Knowing the theory is a huge step to being able to apply the analysis techniques confidently and derive accurate reporting of your data. This textbook is a companion text for GIS Tutorial 2: Spatial Analysis Workbook (for ArcGIS 10.3.x) where you can match up the chapters in each book. Although not a necessity, I would recommend using both texts in tandem to apply the theory and methods discussed with practical tutorials and walkthroughs using ArcGIS. The title of this book might lead you to believe that ArcGIS will feature heavily throughout the text but Michael F. Goodchild sets this straight in the Preface by stating that he applauds ESRI for backing this book even though it isn’t Arc eccentric. The author, Andy Mitchell, presents the material as generic GIS such that most GIS software packages should be able to utilise the techniques discussed. Chapter 1 is a short introduction to what GIS analysis is, understanding the representation of geographic features in a GIS, and the common attributes associated with geographic features that allow for analysis. The wording is simplistic in nature and easy to follow, and acts as a good entrance to the rest of the book. The second chapter begins to delve into the realm of visual analysis, using your brain to to discern patterns for a better understanding of the data and the area that you are mapping. Several real-life mapped examples are displayed to show how ‘mapping where things are’ aids in more focused decision making. The chapter steps through; deciding what to map, preparing your data, and making your map, with comparison figures to show you why you might perform such tasks. Why map the most and least? Because mapping features based on quantities adds an additional level of information beyond simply mapping the locations of the features and this notion is made clear from providing some real-life examples in Chapter 3. The author then takes us down a path to understanding quantities and the importance of knowing the type of quantities that you are mapping, and this naturally leads onto the next topic of classification, why use classes? and choosing an appropriate classification method/scheme for the purpose of your data. It is important to understand how classification methods such as Natural Breaks (Jenk’s), Quantile, Equal Interval, and Standard Deviation classify your data and having a general guideline on choosing the appropriate method. A great recurring aspect in this book is that every chapter begins with a question and Chapter 4’s is ‘Why Map Density?’ and then proceeds to answer the question and the methods available for mapping in a GIS. This chapter discusses density for defined areas, dot density mapping, and density surfaces, what the GIS does to create them and the results of the output. The fifth chapter takes a look at mapping what’s inside an area, discusses why you would want to map inside an area?, and some analysis and results that can be derived from such. Do you need to map a single area to find what’s happening inside or multiple areas to analyse what’s happening inside each for comparison purposes? Methods are explained along with how the GIS performs these for analysis. You might want to find out if a certain feature is within an area, a list of all features inside an area and a count of each, or the sum of a designated land type area within a boundary for examples. Summaries and statistics can also be generated from what is found inside an area boundary. Having assessed some simple techniques for mapping what’s inside an area, the next chapter casts it’s attention towards finding what’s nearby. People often think of nearness in straight lines or along transport networks, but GIS is also useful for travel cost analysis giving weight to different land use or soil types for example when considering the path for a pipeline. Nearness by straight-line distance, distance/cost over a network, and cost over a geographic surface are discussed in detail. At this point we are venturing into understanding some of the concepts behind Network Analysis. The last chapter looks at mapping change with regards to change over time for time pattern analysis. Three ways of mapping change are presented; creating a time series, creating a tracking map, and measuring change, along with the considerations required when creating each type for change in discrete features, events, summarized areas, and continuous categories and values. Following the last chapter there are some recommendations for some further reading. Overall Verdict: The perfect companion for a GIS student embarking on their geospatial educational quest. The theory behind GIS is essential for accurate analysis and troubleshooting. This book is an easy read with a plethora of figures and maps utilised in real-life situations found in each chapter to aid in the experience. Although getting closer to being two decades old this text stands the test of time and acts as a solid base for a foundation in simple analysis using a GIS to find patterns and relationships. The only shortcoming of a text of this nature is that you cannot see how methods and techniques discussed are performed in a GIS. This is where the companion text GIS Tutorial 2: Spatial Analysis Workbook (for ArcGIS 10.3.x) comes in and aids in providing walkthroughs to further enhance your understanding of the underlying theory. Hotspot Analysis uses vectors to identify locations of statistically significant hot spots and cold spots in your data by aggregating points of occurrence into polygons or converging points that are in proximity to one another based on a calculated distance. The analysis groups features when similar high (hot) or low (cold) values are found in a cluster. The polygons usually represent administration boundaries or a custom grid structure. Before performing hotspot analysis you need to test for the presence of clustering in the data with some prior analysis technique involving spatial autocorrelation which will identify if any clustering occurs within the entire dataset. Two available methods are Moran’s I (Global) and Getis-Ord General G (Global). Hotspot analysis requires the presence of clustering within the data. The two methods mentioned will return values, including a z-score, and when analysed together will indicate if clustering is found in the data or not. 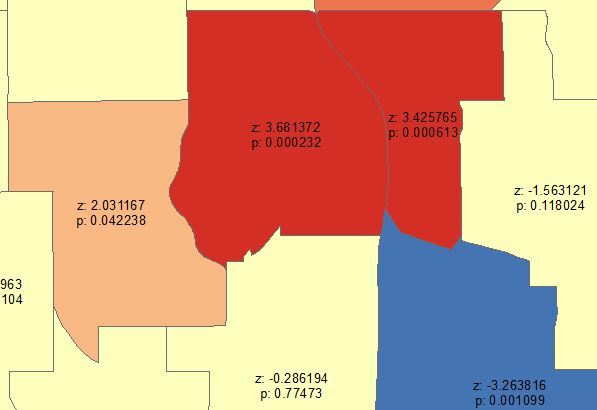 Data will need to be aggregated to polygons or point of incident convergence before performing the spatial autocorrelation analysis, see [An Introduction to] Hotspot Analysis using ArcGIS for an example using Moran’s I. A z-score and a p-value are returned for each feature in the dataset. What is a z-score and p-value? click here. A high z-score and a low p-value for a feature indicates a significant hotspot. A low negative z-score and a small p-value indicates a significant cold spot. The higher (or lower) the z-score, the more intense the clustering. A z-score near 0 means no spatial clustering. The output of the analysis tells you where features of either high or low values cluster spatially. 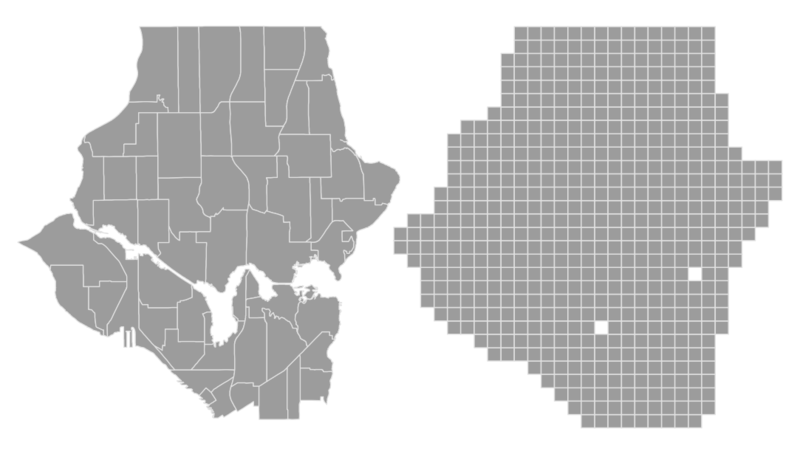 Scale is important, you might notice regional differences between the admin boundaries and the grid (below) and the method you choose will depend on your data and scale of analysis. According to Esri the minimum amount of features being analysed should be 30 as results are unreliable sub-30. When using the grid approach you should remove grid values of zero before performing the hotspot analysis. When performing hotspot analysis make sure that your data is projected. Actually, when performing any statistical analysis processes that require distances it is important that your data is in a projected coordinate system that uses a unit of measurement. A popular projection is the UTM Zone that your data falls into which uses metres (m) as the unit of measurement. An area can be considered a hotspot if a higher than average occurrence of the the event being analysed is found in a cluster. And cooler to cold spots with less than average occurrences. The higher above the average with similar surrounding areas the ‘hotter’ the hotspot. Examples of other areas where hot spot analysis is being used is epidemiology; where is the disease outbreak concentrated?, retail analysis, demographics voting pattern analysis, and controlling invasive species. Note: Hotspot Analysis differs from a Heat Map. A Heat Map uses a raster where point data are interpolated to a surface showing the density or intensity value of occurrence. A colour gradient is applied where cells coloured by the lower end of the gradient represent low density and the higher end representing higher density. The colour gradient usually flows from cool to warm colours such as blues to yellow, orange and red. See Creating a Density Heat Map with Leaflet.